This ring is made of sterling silver (925) handmade in my workshop. This sterling silver ring comes with an etched pattern. The two patterns on this ring are in a square shape. 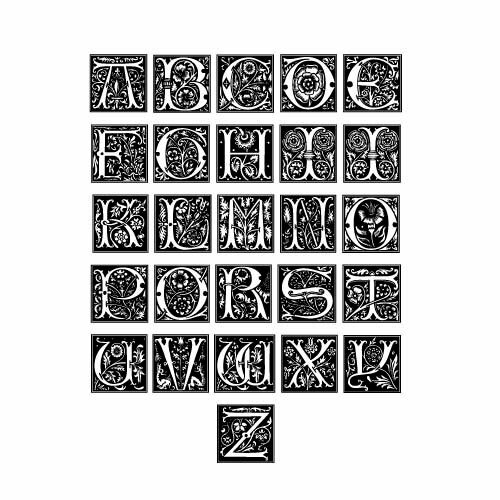 They are two illuminated initials in a medieval style. This ring will be perfect for calligraphy lovers, of the art of writing and of the medieval illumination. It will be a unique gift for Middle-Ages lovers and for the aesthetic of this period. It is a rustic ring. It will be the ideal ring for a commitment, a wedding, a promise ring, a thumb ring or any other special meaning for you. Width of the band: 10 mm (0.394 inches). Please remember this ring is quite large. For a better fit, please take a half size bigger than your usual size. The illuminated pattern is a floral design. Thanks for checking the last black and white picture to see how your monogram will look like. Please allow 3 working days for this jewel.